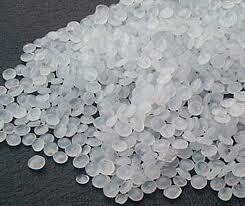 Polyethylene LDPE is defined by a density range of 0.910–0.940 g/cm3. Polyethylene LD has a high degree of short and long chain branching. It is one of the most simplest and common polymer. It has, therefore, less trong intermolecular forces as the instantaneous-dipole inducted-dipole attraction is less. This results in a lower tensile strength and increased ductility. LDPE is created by free radical polymerization. The high degree of branching with long chains gives molten LDPE unique and desirable flow properties. LDPE is used for both rigid containers and plastic film applications such as plastic bags and film wrap.